Doctor Who's new companion will be the first to be openly gay, it was announced yesterday. 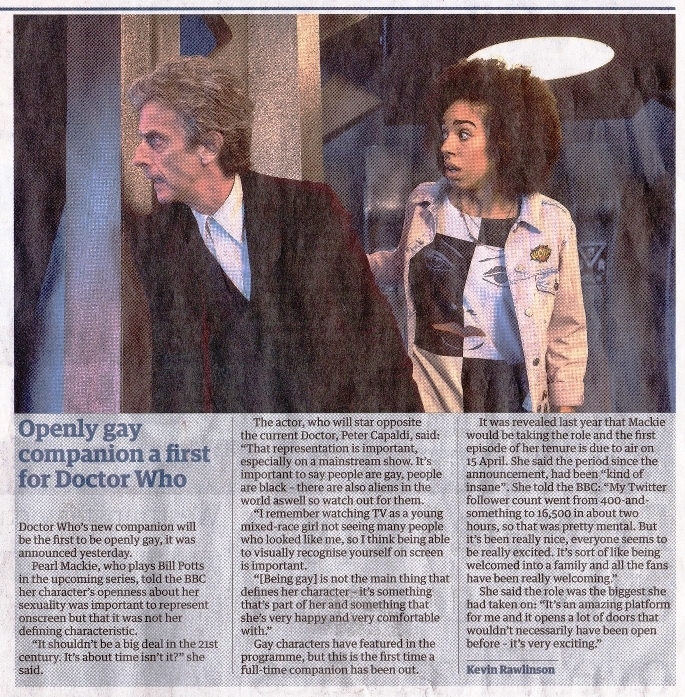 Pearl Mackie, who plays Bill Potts in the upcoming series, told the BBC her character's openness about her sexuality was important to represent onscreen but that it was not her defining characteristic. "It shouldn't be a big deal in the 21st century. It's about time isn't it?" she said. The actor, who will star opposite the current Doctor, Peter Capaldi, said: "That representation is important, especially on a mainstream show. It's important to say people are gay, people are black - there are also aliens in the world as well so watch out for them. "I remember watching TV as a young mixed-race girl not seeing many people who looked like me, so I think being able to visually recognise yourself on screen is important. "[Being gay] is not the main thing that defines her character - it's something that's part of her and something that she's very happy and very comfortable with." Gay characters have featured in the programme, but this is the first time a full-time companion has been out. She said the role was the biggest she had taken on: "It's an amazing platform for me and it opens a lot of doors that wouldn't necessarily have been open before - it's very exciting." APA 6th ed. : Rawlinson, Kevin (2017-04-01). Openly gay companion a first for Doctor Who. The Guardian . MLA 7th ed. : Rawlinson, Kevin. "Openly gay companion a first for Doctor Who." The Guardian [add city] 2017-04-01. Print. Turabian: Rawlinson, Kevin. "Openly gay companion a first for Doctor Who." The Guardian, 2017-04-01, section, edition. This page was last modified on 25 June 2018, at 03:01.